Despite entering the newest month, practically marking the end of summer, we would like to take a HIGH 5 MOMENT and reminisce about the events that took place in August! High 5 Casino welcomed in FIVE new games into its large library, including the newest Lighting Box game, Astro Cat, to join the selection! You can now browse through 269 slot games in your casino lobby, including the recent additions of Rags to Ribbits, Diamonds by Da Vinci, Astro Cat, Wild Tusk, and Cosmic Jewels. Each new slot game to debut was celebrated with a themed XP weekend event! Throughout the month, players enjoyed leveling up inside selected slots with 2XP, 3XP, and even 5XP! These Game Level boosts were not just limited to new games and their XP weekends; High 5-ers were also able to celebrate national holidays with 5XP, such as International Cat Day, National Relaxation Day, National Banana Split Day, and National Dog Day! In honor of International Cat Day on Wednesday, August 8th, besides players getting 5XP in Purrfect, High 5 Casino also held a 24-hour fundraiser to benefit Big Cat Rescue, an organization that looks out for the welfare of felines of all sizes! All qualifying proceeds from the “Lend a Helping Paw!” $2 coin package players purchased was donated. H5C raised a total of $2,537 for this non-profit educational sanctuary! The month ended with the release of the new and improved web destination to play High 5 Casino! High5Casino.com is your ultimate destination to play High 5 Casino, High 5 Vegas, and MORE! With a single login of your existing account, High5Casino.com will allow you to access all your favorite casinos, get the best coin deals, VIP benefits, plus much more! If you haven’t already, enter the Home of Slots portal today! Top 5 games played in August: Rags to Ribbits, Diamonds by Da Vinci, Astro Cat, Wild Tusks, and Forces of Nature! Which game gave you your High 5 Moment in August? What did you enjoy most about High 5 Casino last month? Comment in the conversation bubble located on the top right corner of your screen and let us know! 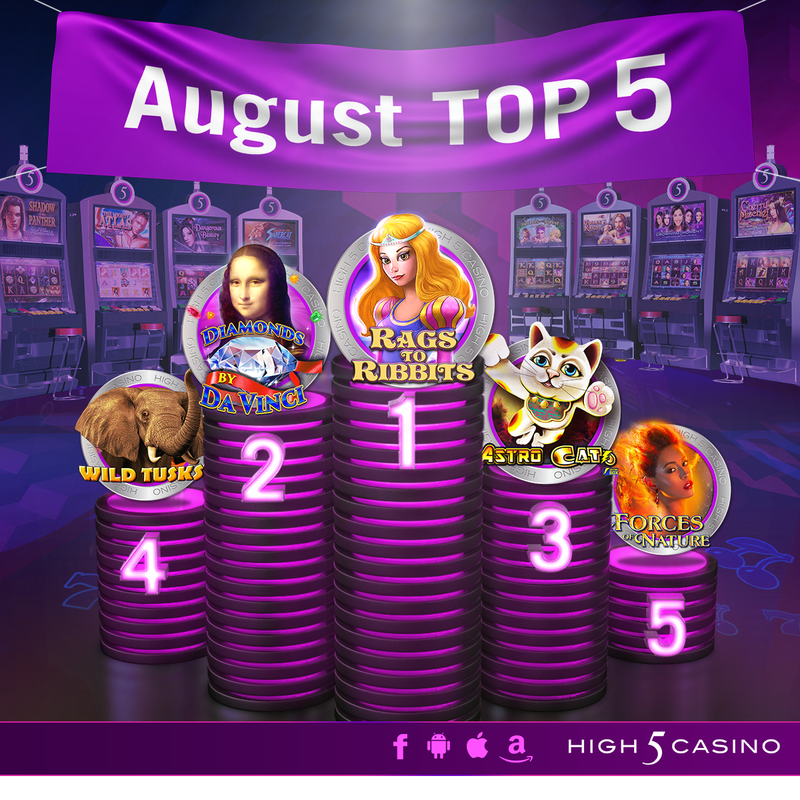 Summer getaways weren’t the only fun way to enjoy the dog days of August for High 5 Casino players! Here is some proof for you: Our players spent almost 5 million hours playing 149 premium slots at High 5 Casino in August. Think about that for a second – that’s approximately 161,000 hours per day. 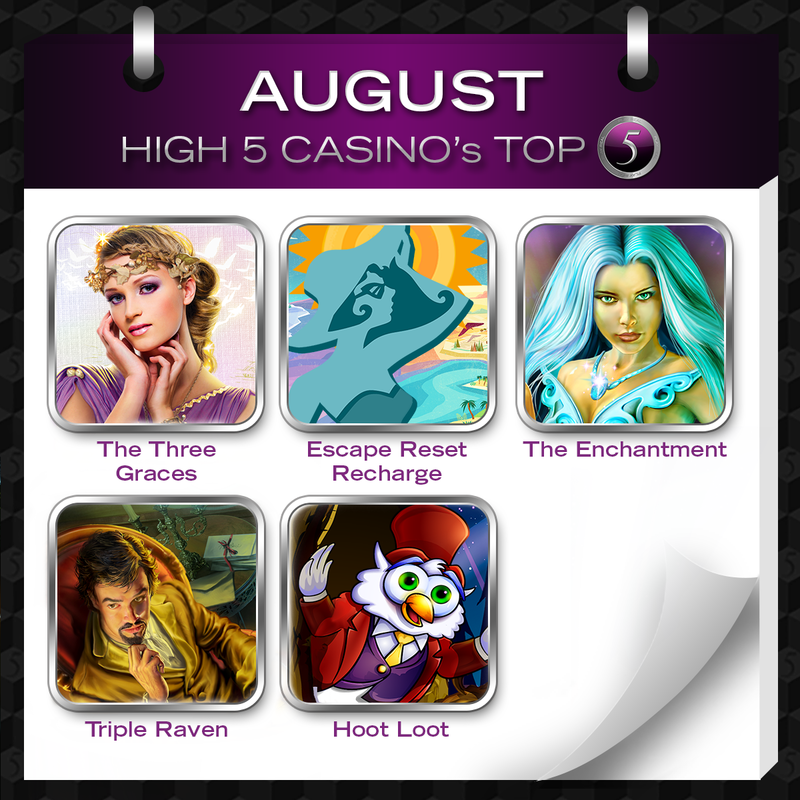 Here are the top five games that rose to the top of their list: The Three Graces, Escape Reset Recharge, The Enchantment, Triple Raven and Hoot Loot. What were your top games in August? Comment in the conversation bubble located on the top right of the blog post to let us know!